A 27-year-old female presented with a history of vague discomfort in the right loin for 6 months with no significant medical history. Clinical examination was unremarkable. She was diagnosed with a right renal cystic tumor (Bosniak type IV cyst) by ultrasound examination. Imaging with contrast-enhanced computerized tomography (CT) of the abdomen revealed a well-defined enhancing mass of 7 × 6 cm size arising from the upper and interpole regions of the right kidney [Figure 1]a. The mass was considered as renal cell carcinoma and right radical nephrectomy was advised. 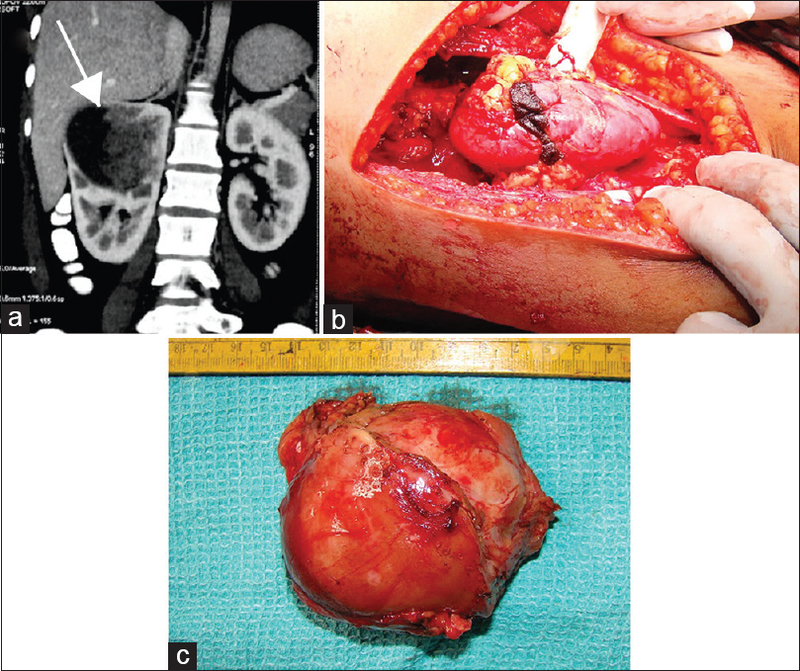 As she was not willing for radical nephrectomy, open partial nephrectomy was performed [Figure 1]b. Postoperative period was uneventful. The complex cystic tumor with the bosselated external surface was excised intact [Figure 1]c. Sectioning of the specimen revealed a partly solid and partly cystic lesion measuring 6.5 × 5.3 cm with a wall thickness of 0.5 cm at the cystic area. The solid area was yellowish brown with areas of necrosis. The cyst contained hemorrhagic fluid. The microscopic appearance was that of a rather well-circumscribed tumor composed of a triphasic pattern of Wilm's tumor with predominantly epithelial and stromal component [Figure 2]a. The blastemal and epithelial components showed an increase in mitotic activity. 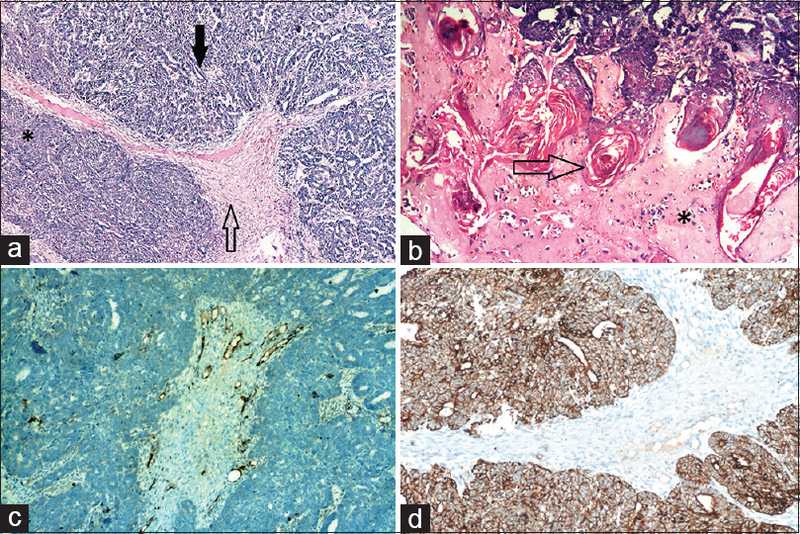 Prominent heterologous components including well-differentiated squamous epithelium with abundant keratin production and cartilaginous areas [Figure 2]b were seen diffusely all over the tumor along with fat and neuroepithelial tissue. Features of nuclear anaplasia were absent. There was no extrarenal extension. Overall, the features were of an adult teratoid Wilm's tumor. Immunohistochemistry showed consistent negative staining with Wilm's tumor-1 protein [Figure 2]c due to a paucity of the blastemal component. The tumor cells stained pancytokeratin positive [Figure 2]d. Subsequently, she underwent completion nephrectomy 15 days later. Postoperative period was uneventful. Histopathology report confirmed tumor-free status and no evidence of lymph nodal invasion. Chemotherapy was given for stage I adult Wilm's tumor with favorable histology. During the follow-up of 5 years, she was disease-free and doing well. Adult Wilm's tumor is very rare with an incidence of approximately 0.2 per million per year in the United States of America and Europe. Although the approach to the diagnosis and treatment of adult Wilm's tumor is based on recommendations for childhood Wilm's tumor, the definite protocol for its management is yet to be defined. The current treatment regime consists of radical nephrectomy and adjuvant chemotherapy with or without radiotherapy, depending on the disease stage. Teratoid Wilm's tumor is a rare histological variant of classic Wilm's tumor and is mainly seen in children. To our knowledge, only two adult patients with large teratoid Wilm's tumor have been reported in the literature., There are no classical descriptions for teratoid Wilm's tumor in imaging; however, the presence of calcification and areas of decreased attenuation in CT could be helpful. These tumors are usually not aggressive and the prognosis is comparatively good if the tumor is excised completely. However, chemotherapy is recommended in these cases irrespective of tumor and patient characteristics. In our case, as adult Wilm's tumor was not suspected, the partial nephrectomy was done initially than a radical nephrectomy. Nephron-sparing surgery is advised for cases with small, low or intermediate risk tumors after a good response to chemotherapy and when ablation of the tumor would lead to compromised renal function or end-stage renal disease. Nephron-sparing surgery has not been advised as primary modality as in renal cell carcinoma. If suspicion of adult Wilm's tumor exists, radical nephrectomy should be advised. This case highlights that adult Wilm's tumor should be considered as a differential diagnosis of renal tumor occurring in young adults especially with tumor characteristics of cystic degeneration and necrosis. Zugor V, Schott GE, Lausen B, Kühn R, Labanaris AP. Clinical and surgical experience with Wilm's tumor. Long- term results of a single institution. Anticancer Res 2010;30:1735-9. Lurie M, Sova I, Mecz Y, Lurie A. Adult nephroblastoma. Cancer 1988;61:2342-7. Seo J, Suh YL, Choi HY. Adult teratoid Wilms' tumor with prominent neuroepithelial differentiation. Pathol Int 2009;59:44-8. Barua SK, Baishya D, Rajeev TP, Mazumder S. Adult teratoid Wilms' tumor-a rare entity with review of literature. Sch J Med Case Rep 2016;4:8-10. Karaca I, Sencan A, Ortac R, Bostanci-Sencan A, Mir E. Teratoid Wilm's tumour: A case report. Turk J Pediatr 2000;42:242-5. Ritchey ML. Nephron sparing surgery for Wilm's tumour - where is the future? J Urol 2011;186:1179-80.